It is absolutely crazy that I go to L'Arpège much more often than I do the French Laundry—was there again just last week in fact—in spite of the former being in Paris and the latter being practically in my own backyard. 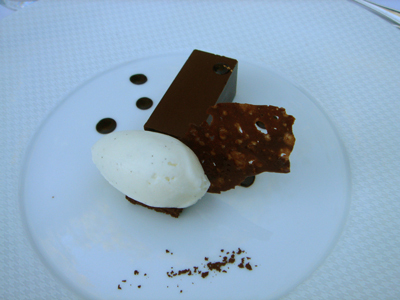 Planning long enough in advance to go to the French Laundry had been unattainable with my crazy schedule—you do believe me about my crazy schedule, don't you?—so it had been two years since the previous time I was there. Well, I finally managed a meal there last Sunday, and not just any meal, but a marvelous Sunday lunch as a guest of my dear friends Lizzie and John (you remember Lizzie and John?). They are very old friends of the house and we were treated accordingly. Everyone, including the chef Thomas Keller, dropped by to say hello. 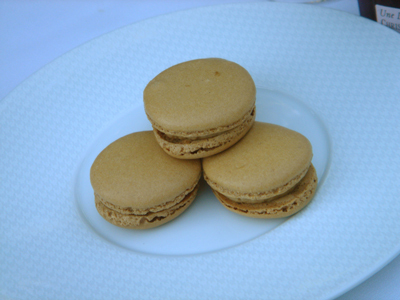 Service at the French Laundry has always been impeccable, it was difficult to imagine how they would do any better than they normally would. But boy oh boy, was I ever wrong? Let me tell you, I simply have not seen anything like it, seriously, definitely not in this country, and not even in France. I went with my friend Dave, a replacement date after my original date flaked out. 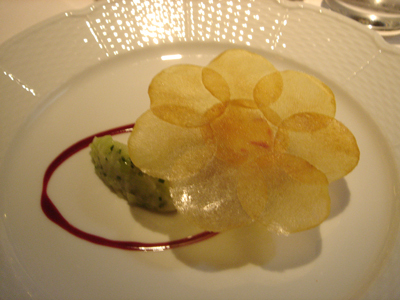 Yes, I heard something about a brain dysfunction—why else would anyone flake on the French Laundry? Well, I ended up driving up from the city to Dave and Ally's house in Napa, and from there, our designated driver Ally took us to the restaurant. How sweet is that Ally? It was a beautiful Sunday, even in the state of hangover-induced stupor from my birthday bash the previous night, I still found it beautiful. The building that housed the French Laundry was just as pretty as ever, hidden on a leafy and tranquil part of the main street that ran through downtown of the gourmandise paradise that is tiny Yountville. Dave and I were a few minutes late, finding Liz and John already seated and sipping champagne at table, in the cozy alcove bathed in sky light in the soothing downstairs room. 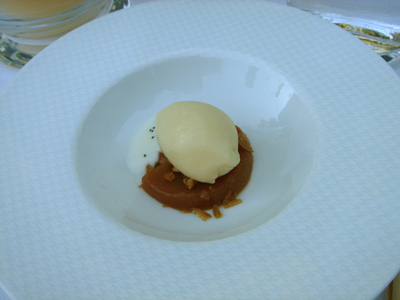 Soothing is always a great descriptor for the French Laundry. Even as we were led through the many courses, many bottles, and indeed many hours meal, nothing ever felt harried or rushed. The atmosphere was ever calm and soothing, the food stunningly simple in its glorious complexity, and the service inconspicuously attentive. Soothing is indeed a good word. I have been a few times before, but nothing in my previous experience has prepared me for this visit as a guest of Liz and John, who are so universally loved by all at the restaurant. As we sat down, our champagne glasses were magically filled with delightful Gimmonet MV, a refreshing start for our long journey into the heart of this temple of gastronomy. Our waiter appeared, inquiring whether we would mind the chef cooking for us. Of course we didn't, so that was that, and our menus were whisked away. We also agreed to let Paul, the delightful sommelier, do the pairing for us with whatever he had in mind. 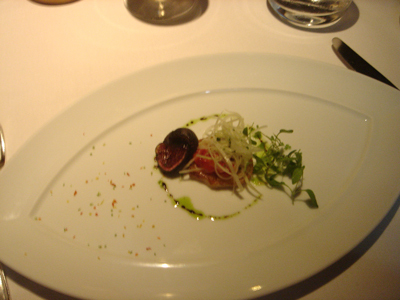 The amuse arrived promptly, the famous cornet of salmon with red onion crème fraîche. I was so happy to have the first course I actually forgot to take a photo. Sorry. Despite this being the end of the salmon run on this side of the continent, the salmon cone was terrifically fresh, oily, and creamy tasting, just the perfect first bite. 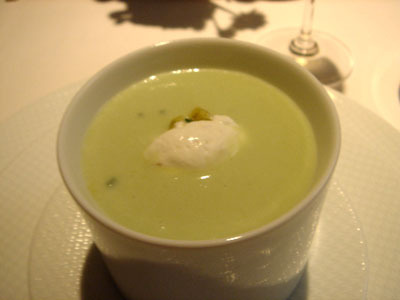 We began with a soup course of delicious fennel soup for the ladies, and cauliflower soup for the boys. Of course we made sure we all had a taste of everything, switching our bowls at mid-course. This was to be the pattern for the meal, so the 18 or so courses that we were served became, essentially, 32. Try that with a hangover. 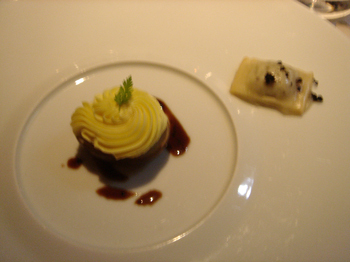 Beyond that the meal became an enchanted blur, punctuating occasionally by rapturous delights of the fragrant Yuzu sorbet, whimsical truffle “pop tart”, sublime partridge, over-the-top foie gras, to name but a few. 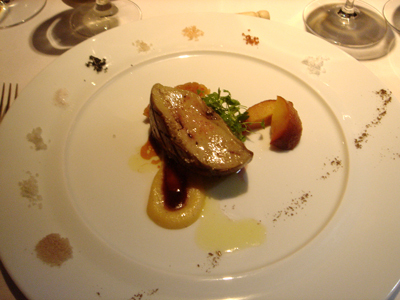 We were also served more wines, and even a few sakes, than I could remember, pairing perfectly with the food. 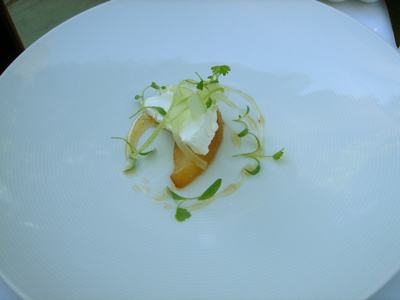 We took a few kitchen-approved breaks between courses, and took our cheese and dessert courses bathed in the gorgeous sunlight in the delightful garden. Everything, the weather, the room, the garden, the marvelous company, the food, the wine, even the water, was perfection. I could not have asked for a better birthday present. I cannot possibly describe every single course and my reaction to each in details, lest this post ends up being 10 pages long, but here's the menu, with photos of course. The paired wines were listed in bracket with the corresponding courses. Cauliflower soup with sultana raisins and almond mousse. 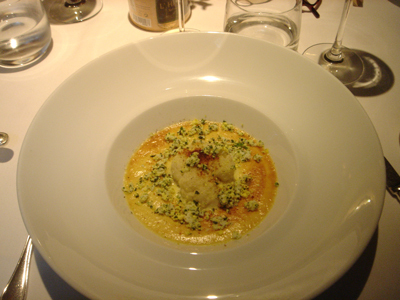 Fennel soup with curry mousse and Valencia orange. 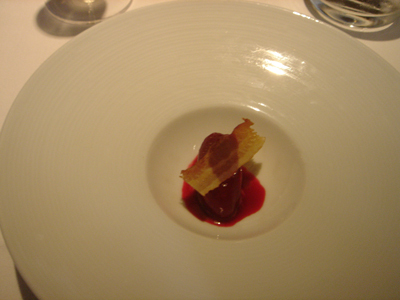 Beet sorbet with apple puree and smoked applewood bacon. Yuzu sorbet with lime jelly and lime zest. I adore the Yuzu sorbet. 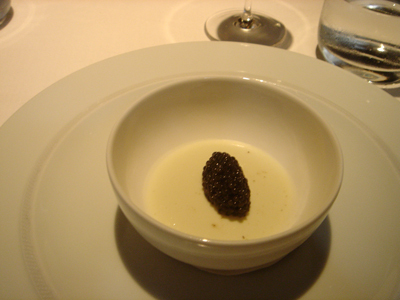 Cauliflower panna cotta with Bagaduce river oyster, glazed and Iranian Osetra caviar. 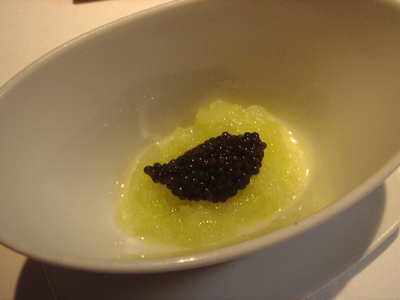 Apple granite with Osetra caviar. 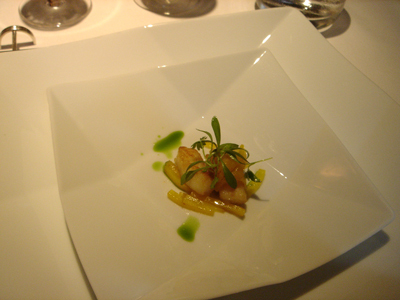 Gougenettes of skate wing with orange water and cilantro oil. 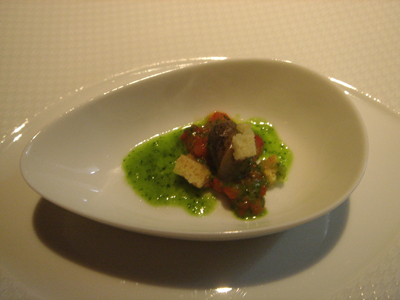 Escargot with parsley “beurre monté” and roasted sweet peppers. 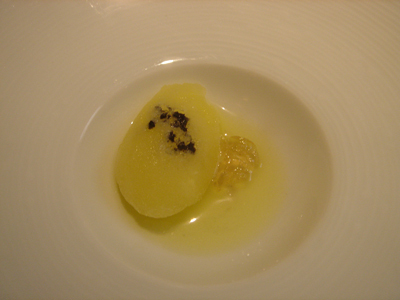 White truffle-infused custard with Périgord truffles. The silkiest and absolutely delicious custard. 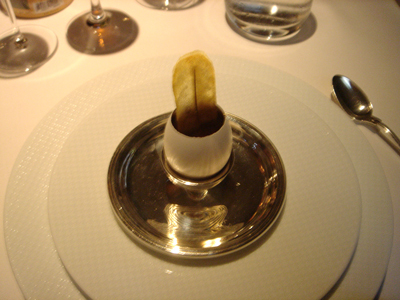 Pickled deviled egg with Périgord truffle “pop tart”. The deviled egg was delicious, but I just adored the pop tart. I had to restrained myself from devouring Dave's half as well. 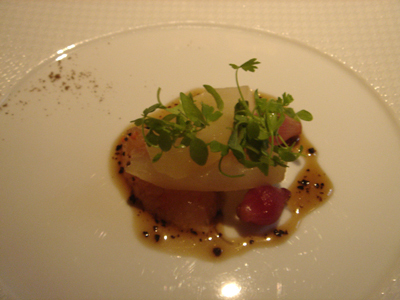 Warm salad of Bartlett pears “cuit en sous vide” with Périgord truffles, pickled pearl onions and a walnut vinaigrette. The pear simply melted on the tongue. 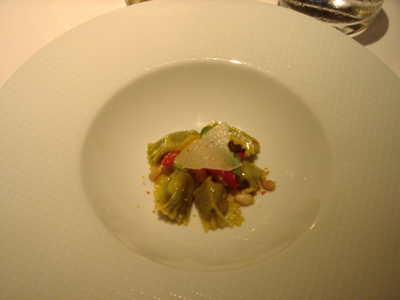 “Pesto Agnolotti”, Italian basil “Agnolotti”, toasted pinenuts, marinated sweet bell peppers, Parmigiano-Reggiano cheese cream and toasted pine nut broth. 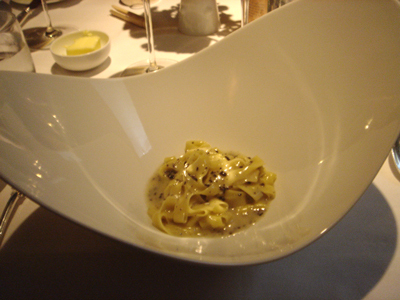 Hand-cut “Tagliatelli” with black Périgord truffles. This pasta was simply to die for. 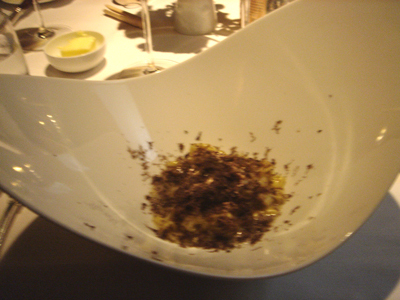 I even abandoned my “black truffles couldn't be good so far out of the season” skepticism for a time and simply enjoyed it. I'm sure it would have been so much better during the truffle season, but that didn't prevent me from enjoying this rendition. 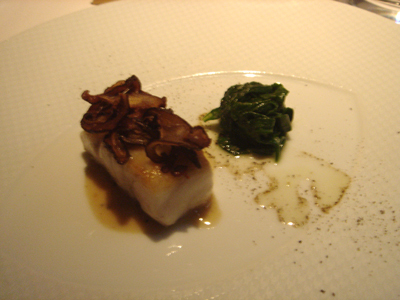 Sautéed filet of Tasmanian sea Baramundi, wilted Arrowleap spinach, crispy Shitake mushrooms and “sauce Mignonette” Both the fish were absolutely fresh and perfect. Butter-braised Maine lobster with red beet essence and “Pommes Maxim”. 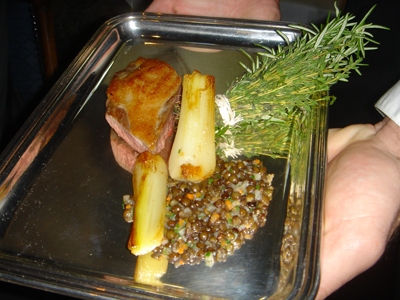 As I am not a fan of beets, I found this dish marred by the intense flavor of beetroots. There was nothing wrong with it, I simply couldn't stand the taste of beets. Too bad. Cauliflower “Polonaise” with a “Saboyon” of roasted sweet garlic. This was given to Dave, who does not eat shellfish, while the rest of the table enjoyed the lobster course. 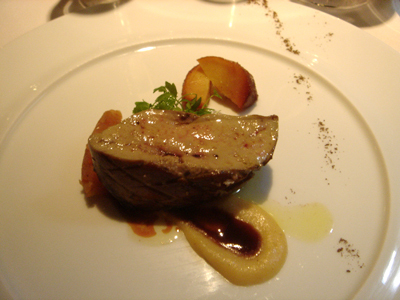 Whole roasted Moulard duck foie gras with Quince and Telicherry pepper “gastrique”. 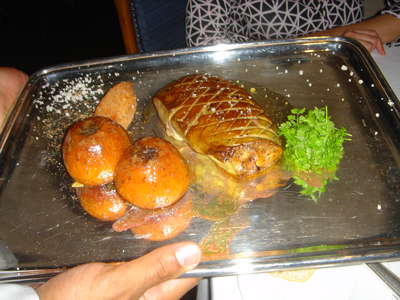 For this course, the restaurant presented us with a whole lobe of foie gras, then cut it four ways to serve. 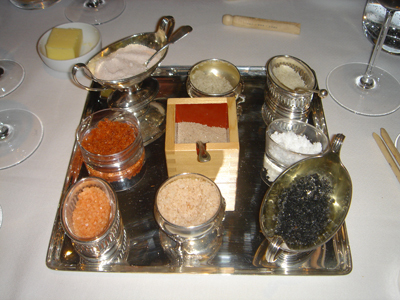 It was entirely over the top, not to mention the nine different types of salt that accompanied the course, from grey and fluer de sel from Brittany to black volcanic salt from Hawaii. It was delicious. 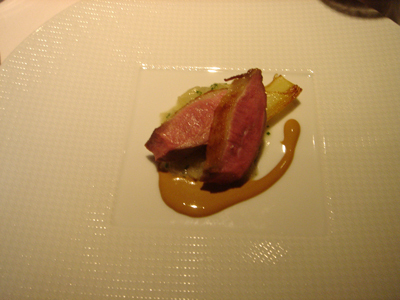 Liberty valley duck breast with marinated “lentilles du Puy”, and fifty-year-old sherry vinaigrette. 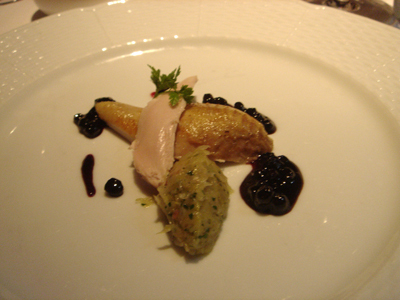 Partridge with Oregon huckleberries, a fondue of King Richard leeks and Walla Walla onions. 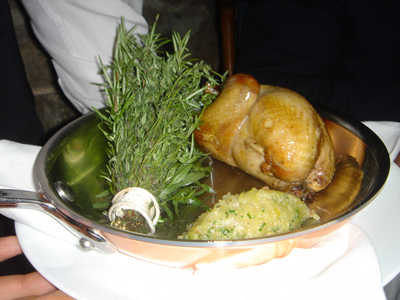 In this course, the duck breat was delicious, but the Partridge was amazing, and paired perfectly with the tangy sweet berries and meltingly delicious leeks and onions “fondue”. 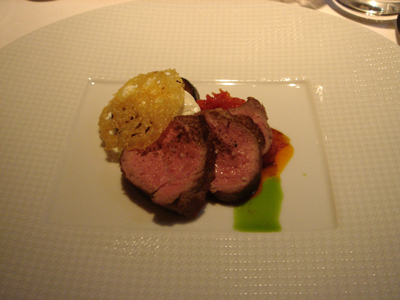 “Chateaubriand” of Marcho farms nature-fed veal “cuit en sous vide”, melted eggplant, stewed garden tomatoes, sweet garlic mousse and parmesan crisp. 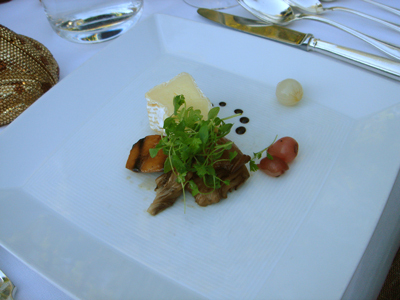 Snake River ranch “collotte de boef grillé”, golden chanterelle mushrooms, French Laundry garden sweet carrots, “Pomme Rissole” and “Beurre Colbert”. 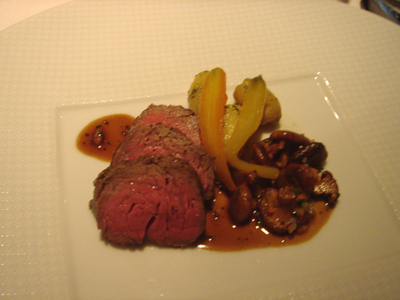 Just as intense, flavorful, and delicious meat course I have had, anywhere. After this course we went outside to take the rest of the meal in the clear autumn air. 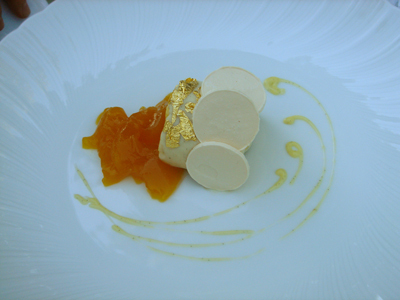 The cheeses were marvelously enhanced by their clever accompaniment, and the desserts were entirely delectable. Allison returned to pick up Dave and I--it had been nearly five hours, after all--so she joined us for the cheese and desserts. “coffee and donuts”. The Platonic archetype of donuts: what all donuts should aspire to be. 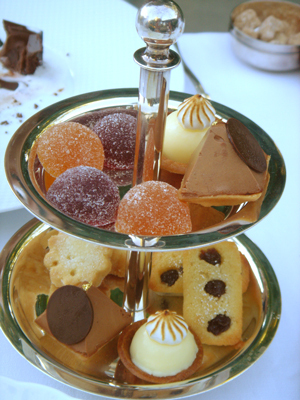 Mignardise, more plentiful for words, accompanied by espresso that was also too perfect for words.